I'm a sucker for a big, cosy coat that looks just as good as it feels. 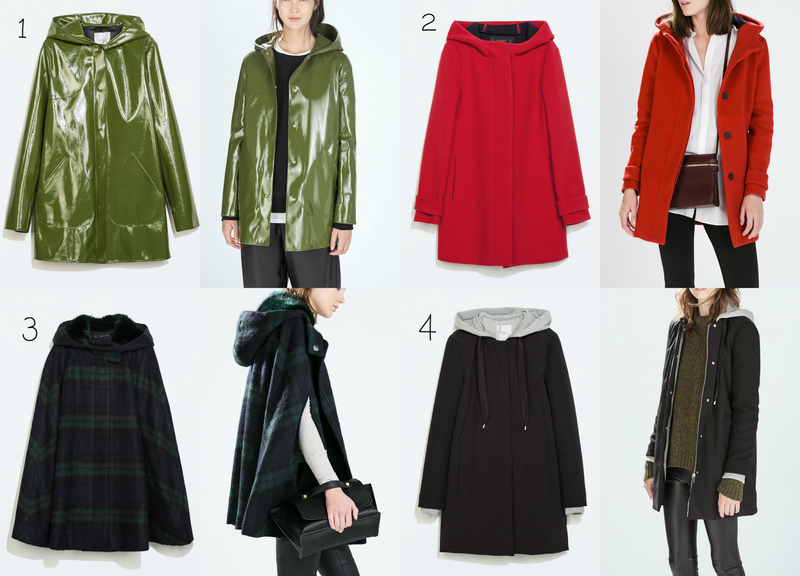 I've picked out 5 very different coats that are on my indecisive list. In other words, I need to buy a new coat but I can't decide which one to get! As you can see, ZARA has fulfilled my needs (and wants) once again, so all of these coats are from ZARA - oops. I have come to the conclusion that ZARA is officially my favourite store without a shadow of a doubt! How many times do I want to say ZARA? 1 // Green Raincoat - It rains a fair amount in the UK, actually it rains too much. A raincoat is on the list. I love the Autumnal, Khaki Green colour too! 2 // Red Wool Duffle Coat - Because sometimes we want to feel like Vivian Darkbloom and pretend we are red coat (please tell me someone knows which TV programme I am referring to!). But this coat is gorgeous and I've never had a bright coloured coat before! 3 // Hooded Check Wool Cape - The Cape is becoming a trend this season and so far, this is the only one I love after seeing Gabby from VelvetGhost post a photo on her Instagram. It looks unbelievably comfortable and the hood is so big! 4 // Black Bowling Coat - Black, Simple, Hood. Basically, me. This will keep my dry and warm and black goes with everything. I actually love all of these, but I'm strangely drawn to 1. 4 is my second favourite though and probably goes with more! I think these coats are so cute. I’m predominantly a fan of #2-4. #1 would look absolutely horrible on me. But I absolutely adore the whole Wool/Fleece look for jackets. I have no idea why. But yes, I love them.